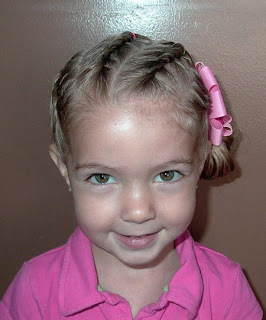 I am a stay-at-home mom of two angel (I truly believe) girls. They are my life and my loves. 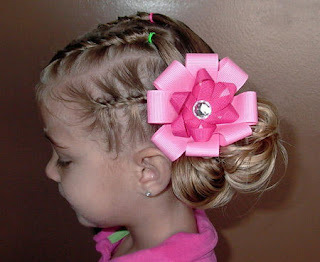 I have always loved doing hair… and doing it in fun, cute ways is a highlight to my day. I love to share them, and of course, show them off on my babies!! 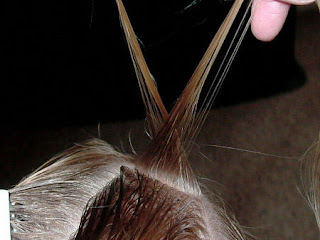 Here’s our angle on hair! 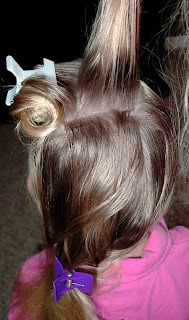 A super cute sideswept ‘do. This one always gets a TON of compliments! 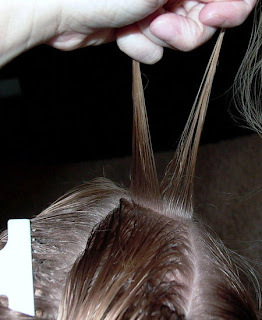 It works great on short or long hair! 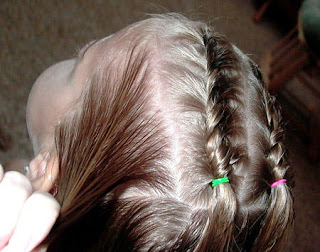 Items Needed: 5-6 elastics, spray bottle (or means to wet hair), and comb. 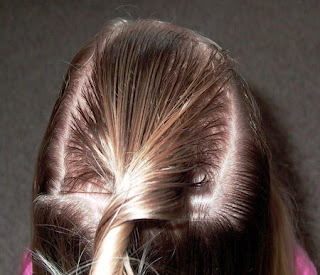 A large doodad for the hair is also a bonus. Hairspray is a must! 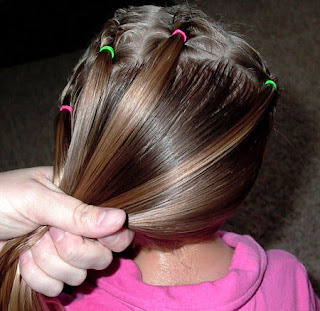 Finish off by twisting tightly without adding more hair, and secure with elastic. Do the same thing in next parted off section. 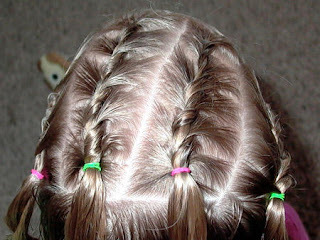 I used varying colors of elastics just to make it fun. See the cute angles? DARLING! 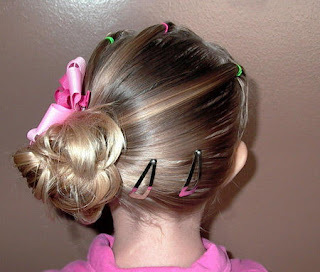 If you have shorter hair to work with, then make it into a pony, or a pull-through pony. Here I’ve done what I call a Stuffed Bun. 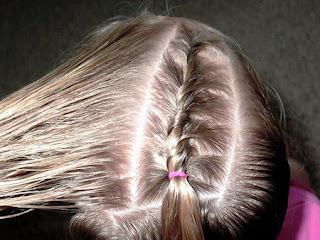 Do a pony, then on last time through, pull through halfway. 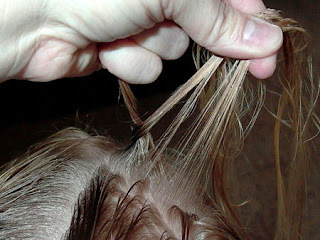 Take long tail and loop around and ‘stuff’ it back into the elastic. 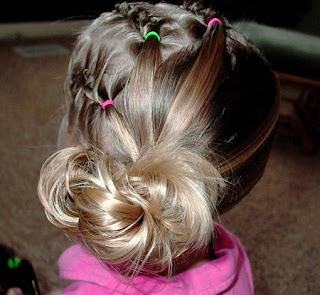 (For tips on how to do this easier, see my blog post Stuffed Bun). Keep stuffing until it looks nice and messy. I don’t like the double loop look, so I just keep stuffing in until I like it. Spray well with some spritz!! 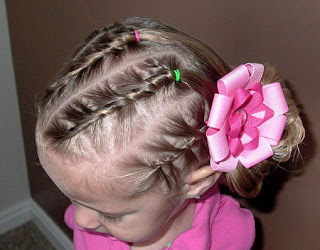 I also added some snap barrettes, since side ponys can have escapees out the back easily.. Stick in a super darling doodad (I got mine from Madibu Bows!) to draw attention to your girl’s “Angle”! And show off that super cute smile!! Do you think she has an “angle” underneath that angelic expression? *Note from Mindy: If any of you would like to enter our Hairdoer of the Month contest each month, please click the link for details!